Anyone familiar with P.I.D Process, Integral, Derivative form to continually process the best algorithm to bring a process value into its set point range. I have experience using P.I.D. controllers but I don't have enough experience to write the C++ code. any help would be extremely great. I am using a Mega r3 to read an analog input so I am receiving a value 0-1024 and that value needs to be continually processed into a voltage output 0-5v when the process is outside the Set Point value. No need to write the algorithm, that has been done quite well here. The main problems for you will be measuring the pH and controlling the pump. When you can do both of those, then you will need to tune the PID parameters, Ki, Kd and Kp. There are many on line guides to general approaches. A great example of how not to code! The only comment explains the only self-obvious feature! You could use gain scheduling. But output scheduling would be a good choice for pH as it is nonlinear. 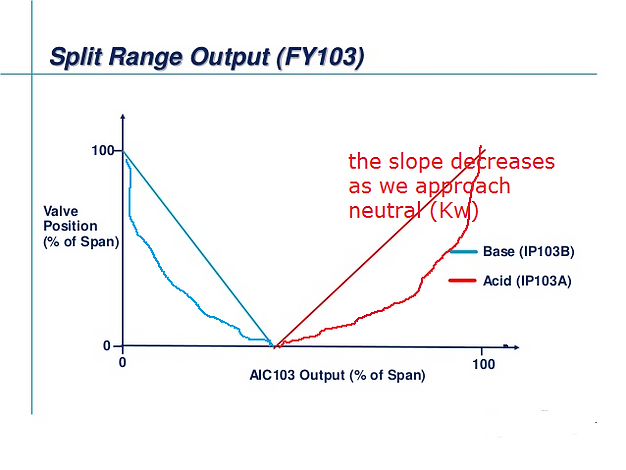 Also you could use model predictive control if you have a titration curve for the fluid. here is a really raw output scheduler. you need to adjust the sheduling tables based upon the fluids and pumps and output types. How would you do it then? Please explain the code so I can understand what parts control what processes? Use output scheduling in lookup tables to do this. ill try and decipher this into layman's terms. Really, the look up tables let you compensate for the fluid abruptly changing pH. you want the integral action to have some time when you are close to target. Let the solution mix so to speak. The other thing output scheduling does for you is let you compensate for the reagent strengths and the pump characteristics independently. Some pumps are linear others not so. I would also leave a very small gap with no action between the two pump outputs to lower reagent possibility of counter titration/ neutralization. Just one opinion.... you are using PWM, but you might also switch to a duty cycle arrangement if you have on off pumps,,,jut be sure to run the cycle time longer than your mixing time to avoid over adding reagents. in this way you could vary the duty cycle length too as you approach SP. so as to give the solution a chance to ge whatever you are trying to neutralize.....the idea of feed forward is also good if you can measure what is coming in to your tank. It is important to make the inlet and the addition point close together and as close as you can to the mixer if you have one. IF you look you may get in touch.